I love working with seasonal flowers. So it was such a joy when Kathryn asked for daffodils, tulips, ranunculus and other bulb flowers to use for her and Roberto’s wedding at the beginning of March. The lucky couple got married in a lovely village church in Cambridgeshire, followed by a wonderful reception at a stunning venue – The Manor Barn – a unique old barn just 20mins away from Cambridge. Kathryn loves colours, so we made a really colourful loose bridal bouquet with a selection of spring flowers. To complement the bridesmaids dark purple dresses we arranged for them to carry bright yellow posy bouquets. For the flower girls we created flower circlets using ranunculus, narcissus and lavender foliage. To add some colour into the stone built church we tied spring posies in jam jars to the each of the pew ends. At the venue we hung lilac/purple bunting and an innovative seating plan! Instead of a traditional seating plan Kathryn came up with the idea to use a ladder, with the guest table lists marked onto antique juice bottles filled with scented yellow narcissus. For the guest tables we created miniature English gardens – herbs planted in a aged terracotta pots, ceramic birds, daffodils in mossed planters, and a selection of jam jars and miniature bottles with bright spring flowers sprightly popping out of them. It was such a pleasure to be a part of this beautiful country wedding. The sweet couple gave out Sunflower and Wildflowers seeds for us to take home to remember their special day. 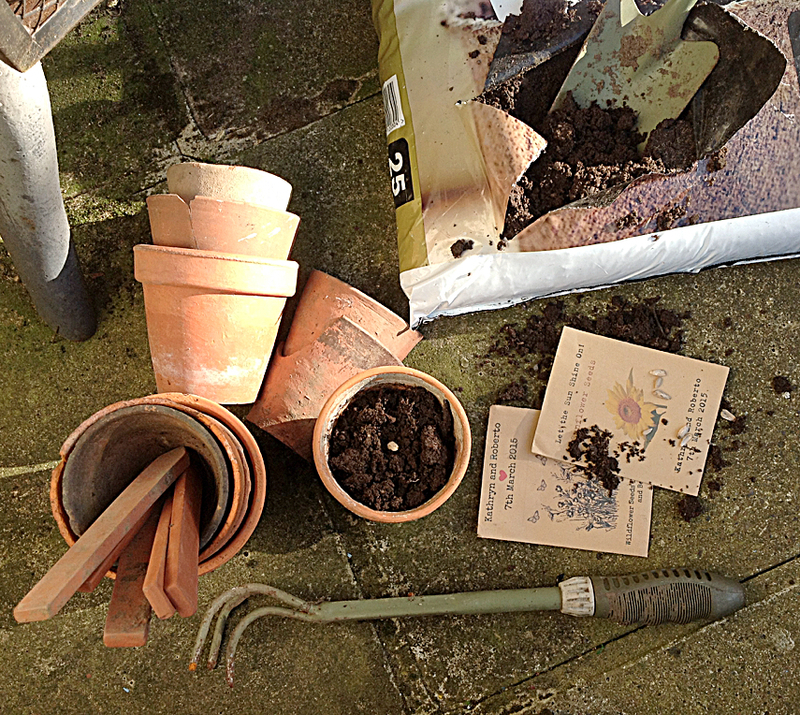 So, today was a perfect day to start sowing! Hopefully in a few months we’ll see a results, and remember their gorgeous wedding day! A big THANK YOU to Lyndsey from Lyndsey Challis Photography for letting us share her beautiful work (and giving us a helping hand at the venue)!